Lion Tony joined the Kent Lions club on March 1st, 2001 sponsored by Mike Sepi. Lion Tony has had 100% attendance for sixteen years, was President of the Kent Lions in 2004-2005 and received the “Lion of the Year” three times. He has also served as club Membership Chairman, Director and Carnation Chairman. From 2008 till 2011, he served as District Membership/Retention Chairman, then as Zone Chairman for seven years (2011-2017). Lion Tony serves on the State Finance & Planning Committee representing the District. At the 2017 District OH4 convention in Hudson, Lion Tony was elected 2nd Vice District Governor of District 13 OH4. He is a Melvin Jones Fellow. Lion Tony lives in Cuyahoga Falls, has two children, Mitch & Brittany and an English Bulldog, Baylee. Lion Tony is a Realtor of 25 years and works for Markley Realty in Stow. He’s retired from the City of Kent Water in 2006 and owns a water consulting company. 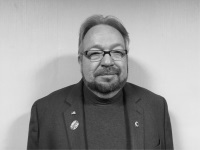 In 2013 Tony was President of the Akron Area Board of Realtors and is currently President of CRIS MLS.